Criminal justice schools in New Hampshire prepare students who aspire to work toward exacting justice in the state, from law enforcement on the streets to the state’s Supreme Court and everything in between. Those who want to serve in the courts as judges, lawyers, court reporters and paralegals can get the foundation they need to pursue these goals through a criminal justice degree program. In addition, students can also use criminal justice schools in New Hampshire to train for a variety of law enforcement and correctional professions around the state. This page explores the landscape of opportunities criminal justice schools in New Hampshire provide; read on to get information on degree programs, careers and employers in the state. After Criminal Justice School in New Hampshire: What's Next? Not all criminal justice schools in New Hampshire will meet the specific needs of every student, so applicants must choose wisely before enrolling in a program. The schools ranked below are some of the best programs for this profession in the state. Designed to help students decide which criminal justice school will be the best fit, each has been evaluated based on several statistics including enrollment, acceptance rate, and teacher-student ratio to determine individual score and rank. Founded in 1968 as New Hampshire Community Technical College, today's River Valley Community College offers a choice of thirty-five career-oriented programs and associate degrees that serve as the first two years in a four-year college education. Students can also take coursework at the Keene Academic Center or completely online. The 65-credit associate of science degree in criminal justice can be completed in two years. Students may also enroll concurrently at Granite State College to complete their four-year or master's CJ degree after graduation from RVCC. Applicants to the CJ program must take the ACCUPLACER exam. Great Bay Community College was founded as the State Trade School of Portsmouth in 1945 to provide vocational and trade training to its first class of 130 students. Today it serves 2,000 students with more than 30 associate degree programs and certificates in business, criminal justice, hospitality, technology, allied health and education. The associate of science degree in criminal justice requires 68 units for graduation and is offered on campus or entirely online. In the final year, students either complete a 120-hour CJ internship or a three-credit independent research project/topic paper. NHTI - Concord's Community College was founded in 1965 and today has grown to feature 90 academic programs serving 4,568 students. NHTI offers curriculum leading to 41 associate degrees and 47 undergraduate certificates. The 65-credit associate in science degree with a major in criminal justice prepares students to enter the police and law enforcement professions or to transfer to four-year CJ degree programs. Students are required to pass background checks prior to undertaking practicum or internship opportunities with agencies such as the Merrimack County Attorney's Office, NH Department of Corrections, NH Public Defender's Office, or NH State Prison for Women. Located in Berlin, White Mountains Community College was founded in 1966 as the New Hampshire Vocational Institute. Today's academic programs feature small class sizes and a focus on the use of educational technology. Associate degree programs may include a combination of classroom, laboratory work, and online instruction. Students can complete the 71-credit associate in science degree in criminal justice/homeland security program in two years. The program requires preparation of a senior project and completion of a supervised internship. WMCC's 34-credit criminal justice professional certificate program takes one year or less to complete. At Granite State College, students in the criminal justice program are prepared for a career in law enforcement, with classes that provide a foundation of knowledge in correction, law, criminology, probation, parole, and advocacy. Curriculum also covers more general areas of study including research methods and statistics. The majority of program participants are transfer students, and most of the program's courses can be taken online. Non-traditional students who have military, workplace, or volunteer-based training may be able to earn academic credits from their experiences. The school offers counseling to prospective students considering their college choices, as well as career counseling for current students and alumni. Southern New Hampshire University's criminal justice program is online, making it a convenient option for working students or distance learners. Students can take a general studies track that provides an overview of criminal justice topics, or choose from six concentrations to specialize their studies. Instructors guide students through simulated scenarios where real-world challenges are presented in the classroom, and peers collaborate to develop solutions. The school has a wide alumni network that can be accessed for internship and career opportunities, as well as academic and career advisors who specialize in criminal justice studies. The school welcomes transfer students and has a generous acceptance policy for transfer credits. Students in Franklin Pierce University's criminal justice program learn to work with diverse populations, with curriculum that addresses the social dynamics affecting issues of gender, race, and religion. Learners will gain an understanding of the career roles available for criminal justice professionals, with an emphasis on positive social change. Many of the program's participants join the university's Student Government Association for political and judicial experience. Others serve on the school's Student Judicial Board, or work as security officers, EMTs, and firefighters on campus. Internship opportunities are available at local, state, and federal correction facilities. Students can also choose to study in Washington, DC for a semester at the Washington Center. At Saint Anselm College, students in the criminal justice department learn about crime, victims, and treatment of offenders. Curriculum focuses on law enforcement, the courts, prosecution, and correction. Students complete ten required courses, combined with general education classes and electives, to earn their degree. The school strongly encourages criminal justice students to take Spanish language courses as well. Support services are offered through the Academic Resource Center, which houses a peer tutor program, a writing center, and a College Achievement Program that helps first-year students gain study and learning skills. Students can also find support through the campus ministry, which welcomes individuals of all faiths. Plymouth State University's criminal justice department offers an interdisciplinary education that prepares students with problem solving techniques, computing skills, communication skills, and proficiency in a foreign language. Instructors also impart a respect for the importance of professionalism and ethics. The school accepts transfer students, but does not award credits for any professional, military, or life experience. In addition to required classes, students can choose several electives to suit their areas of interest, from women and crime to the sociology of race and ethnicity. Students can prepare for graduation and beyond with the school's career services center, offering job listings, internships, and career peer advisors. 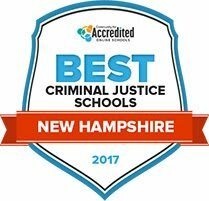 Those interested in exploring all the degree specialties and degree levels criminal justice schools in New Hampshire offer can benefit from searching all the options below. Narrow and compare results based on tuition costs, campus size, degree level and more to see all the options for earning a criminal justice degree in the state. As students make decisions about how they want to use their education when they graduate, they often factor in their future careers and earning potential. Before choosing a specialization or focus, explore the information on popular jobs available to people who attend criminal justice schools in New Hampshire. Stats below include how many workers can be found in these positions and the median salaries these professionals earn across the state. How do New Hampshire’s criminal justice jobs compare to the rest of the country? In this section, we answer that question by providing a look at the salaries and job growth of professionals in a variety of jobs in the field. Before choosing whether or not to attend criminal justice school in New Hampshire, see how the state stacks up compared to the rest of the nation. As students work to complete their degrees from criminal justice schools in New Hampshire, they will naturally start thinking about the possible places they can find work after graduation. The map below provides a sampling of organizations around the state that may hire those with criminal justice degrees. In addition, there is geographical information that shows where the most criminal justice jobs are located by city or geographic area in the state. A business organization designed to connect in-house corporate attorneys in the northeast part of the United States. The group provides education and networking events and hosts a job board for members. New Hampshire Employment Security (NHES) provides guidelines for businesses to help them make hiring decisions that conform to the law. This organization provides information on the best practices for building businesses in New Hampshire, as well as economic development training and professional networking opportunities. A directory for the many Chambers of Commerce spread across the state of New Hampshire. Each Chamber represents different business initiatives and advocacy efforts, including passing legislation and working as the liaisons between businesses and the communities they serve. A volunteer based organization that works on breaking down prison stereotypes and reforming criminal justice policies in regards to the correctional system. Provides information on the state’s correctional facilities, as well as news about the agency and resources for crime victims. A department within the Division of Children, Youth and Families, the JJS runs juvenile corrections programs and rehabilitative services that help prevent young people who have committed crimes from re-offending. Those interested in the field of probation and parole can find a description of responsibilities and supervision techniques used by the New Hampshire division here. In this guide, the New Hampshire Bar Association provides a look at the state’s court system. Includes information on the history of the courts, jury service, criminal and civil law, and the rights of defendants and crime victims. A non-profit organization for Court Appointed Special Advocates who help abused and neglected children through court cases in New Hampshire. Volunteers are educated on the legal processes associated with the children they serve, and signup information is available on this site. Students who want to work for the New Hampshire judiciary can find information on the different courts in the state, as well as how mediation and arbitration works. In addition, the website allows users to file legal documents electronically. This page provides information about the Superior Court of New Hampshire and the types of cases that fall under its jurisdiction. The New Hampshire Bar Association provides the programs and resources that attorneys need to be successful in their practice areas. This site includes information on how to be admitted by the bar, news about the industry and publications that address the issues important to New Hampshire’s lawyers. Court reporters in New Hampshire can get education and business support through this association. Those interested in becoming a court reporter can also find licensing information here. Providing legal services to the financially needy, such as seniors and low-income families, New Hampshire Legal Services offers volunteer opportunities and career information on this page. The Paralegal Association of New Hampshire (PANH) has provided professional services to promote the paralegal industry since its inception in the 1970’s, including education and networking events and opportunities for members. Aiming to advance and advocate for women in the legal industry in the state, this organization provides leadership, educational and networking opportunities to members and scholarship and volunteer opportunities to students. The Animal Control Officers Association provides education and outreach to those who work in and are interested in learning more about the animal control field. The Division of State Police is responsible for ensuring that New Hampshire’s public safety laws are enforced. It also oversees security services and detective agencies around the state. The state’s forensic laboratory examines evidence provided law enforcement agencies on the city, rural and state levels, as well as fire departments around New Hampshire. Learn more about the department here. The Department of Safety is made up of several agencies that keep the public safe, including the Division of State Police, the Division of Motor Vehicles, the Division of Fire Safety and the Division of Homeland Security and Emergency Management. Each offers training and department information through this site. This community is made up of the state’s active and retired law enforcement officers. The group offers events, a message board, scholarships, a newsletter and classified ads online. A group that focuses on environmental and legal issues that impact the state by educating the public and lobbying members of the legislature. This agency enforces the laws related to wildlife, maritime and fish in the state. Find more information about how to become a Conservation Officer and the initiatives and programs run by officers here. The New Hampshire Wildlife Federation provides education programs and legal and legislative support to help preserve the state’s fish and wildlife habitat. Provides information about the state’s parks, forests and beaches, as well as how they contribute to New Hampshire’s economic growth.